BEST IN SHOW plays this Friday in Fort Greene Park. Three weeks of free movies with Fort Greene Park Conservancy and Alamo Drafthouse start Friday. Enjoy Christopher Guest’s uproarious mockumentary along with your pooch. Dog owners are welcome to bring their pets and will have the chance to parade them before the audience in a pre-movie dog show. Alamo’s version of LABYRINTH allows the audience to sing-along with the David Bowie tunes and quote the best lines of the movie. Free souvenir props will also be available for the first to arrive at the park. One week before the release of FINDING DORY, kids big and small can revisit Pixar’s original aquatic adventure with the Tank Gang. Costumes are encouraged, and surprises are in store. Screenings will take place at sundown on the Myrtle Avenue lawn and will be complimented by themed festivities before the show. DJ sets start at 7:30, with activities and films to begin at dusk. 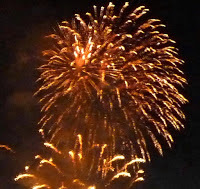 Fireworks were shot off about 360 yards east of Liberty Island tonight at 9:25 p.m.
You could see the display from Brooklyn and the other boroughs of NYC, as well as New Jersey, as they went up over the Hudson River. NYC could provide no details of the events sponsor. We're wondering it it had something to do with Fleet Week? 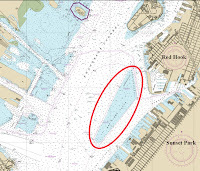 On Monday, May 24, a DEIS Public Hearing will be held in at 6:00pm at St. Francis College (Remsen St. and Clinton St.) in Brooklyn Heights to discuss Citywide Ferry Service. The New York City Economic Development Corporation (NYCEDC) is working with the Office of Mayor de Blasio to launch the service. 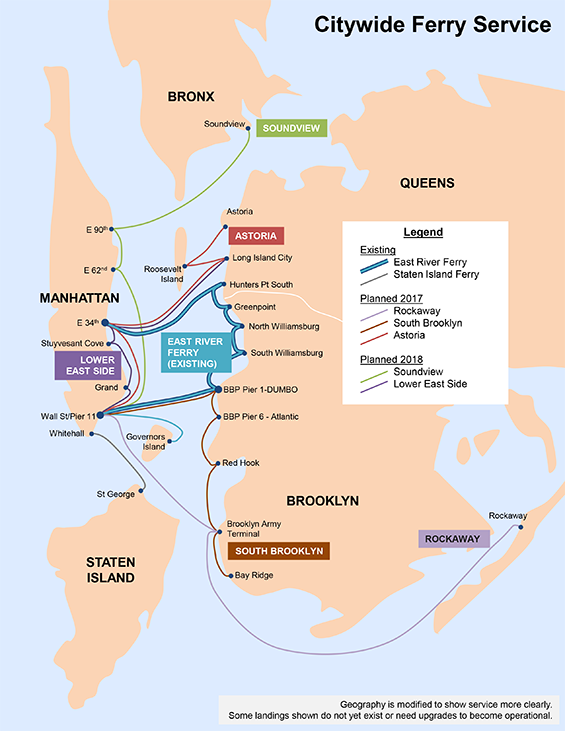 It will consist of five new ferry routes in addition to the existing East River Ferry service, charging a fare of $2.75. Meetings will be held in the other boroughs as well. Colleen Flanigan, To the Sea, 2014. The third annual Billion Oyster Party is taking over Pioneer Works in Red Hook on Thursday, May 19, from 6 to 10 p.m. More than 40 oyster farmers will be shucking and serving up their delicacies and some of the city’s top restaurants will be presenting bites. More on the Billion Oyster Party here. 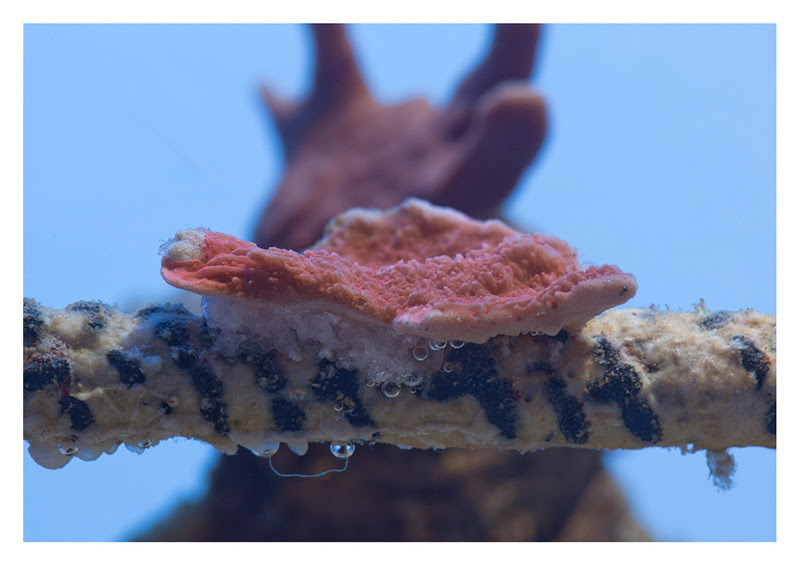 Inspired by Brooklyn's native oyster reefs, this immersive installation will feature color photographs of artist Colleen Flanigan's underwater sculptures and an installation of Judith Pleva's unbound multimedia scrapbook. The show's opening will take place on Thursday, June 2, 2016, from 5 PM - 7 PM at the Brooklyn Bridge Park Community Room at 99 Plymouth Street in Brooklyn. A talk with the artists and curator will be held on Saturday, June 25, 2016 at 1 PM at the Brooklyn Bridge Park Community Room at 99 Plymouth Street in Brooklyn. The talk is free and open to the public. Seating is limited. We've long followed the writings of Brooklyn runner/blogger (What You Do Not Know Because You Are Not Me) Michael Ring, who was paralyzed when he was struck down by Guillain-Barre Syndrome. Now, the Daily News reports, he plans to walk the Brooklyn Half Marathon on Saturday. "That Ring, 52, of Park Slope, Brooklyn, is moving at all is a credit to savvy doctors and his own indomitable spirit," the News reports. "'His mentality is unbelievable,' said Dr. Jung Ahn, director of rehabilitation medicine at NYU’s Rusk Rehabilitation." The man is amazing. Good luck and godspeed in your race, Michael! Looks like it's going to be a long, hot summer at Brooklyn Bridge Park. 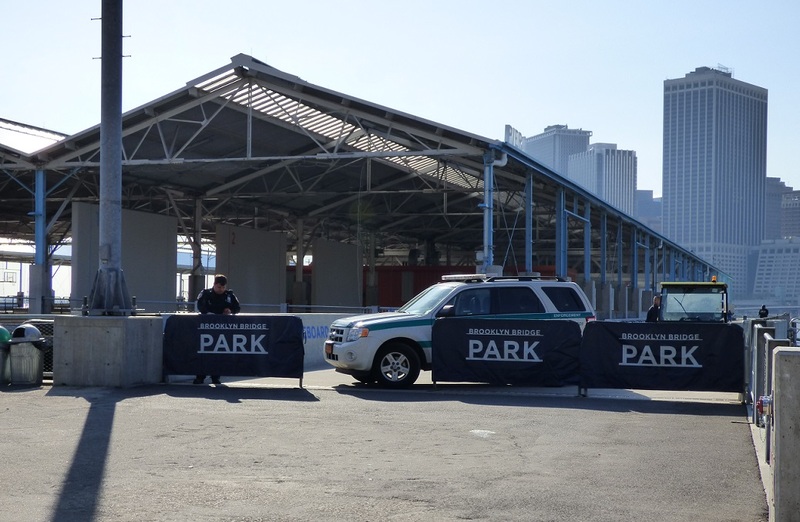 Another evacuation of the park by police took place on Wednesday, May 11, after hundreds of young people gathered at Pier 2 and a brawl broke out, the Brooklyn Eagle reported. 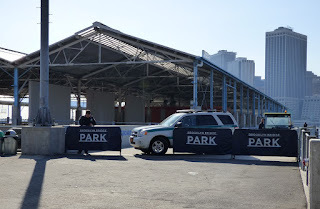 This is the fourth rumble in the park at Pier 2, and the pier -- where the basketball courts are located -- has been shut down by cops several times. The community is up in arms. The Brooklyn Heights Association told the Eagle that the 84th Precinct now has 16 additional police officers assigned to the park. 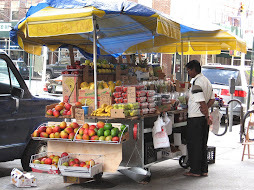 BHA urged community members to attend the Tuesday, May 17th meeting of the 84th Precinct Community Council at 7 p.m., at 160 Schermerhorn Street, to discuss the problems. A Pop-Up Dinner planned for June 11 is sold out, according to the Prospect Park Alliance. The wait-list, however, is still accepting names. 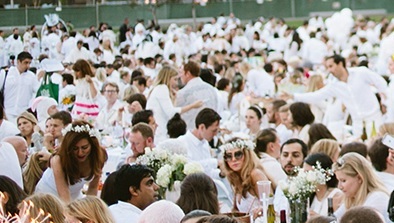 Pop-up dinners are elegant white-attire-only events that draw thousands. The venue, tables, chairs and entertainment are provided by organizers. Guests come dressed in all white and bring "inspired" culinary dishes, wine, table designs and table cloths.The exact location is revealed only at the last moment. It's quite a sight to see a sea of white-dressed guests dining al fresco. Brooklyn Boulders in Gowanus continues to experience "capacity limitations" due to facility upgrades [i.e., building code violations], according to their website. Seems like it might be a good time to visit DUMBO Boulders in Brooklyn Bridge Park. The facility specializes in bouldering (as opposed to roped climbing). It's the first outdoor climbing wall in the city. The day pass ($9) includes shoes, the facility's front desk man told the Brooklyn Eagle. “It’s good for the whole day. You can come here and climb till your hands fall off." The fastest sailboats in the world raced this past weekend in the America's Cup's New York City stop. The boats were becalmed on Saturday, but the race went on as planned Sunday and the huge crowd in lower Manhattan was thrilled. The harbor was packed with boats filled with spectators. Emirates Team New Zealand took first, while Oracle Team USA (shown above) came in second place and Groupama Team France third. The race continues elsewhere in June. Want to see some crazy fast sailing? 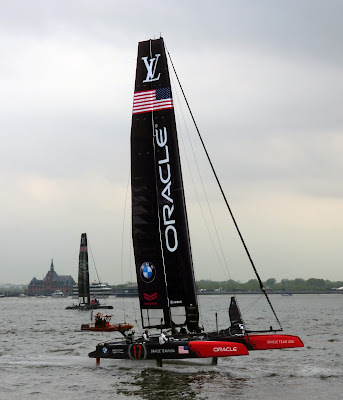 America’s Cup racing will return to New York for the first time since 1920 with Louis Vuitton America’s Cup World Series racing on May 7-8. Six America’s Cup teams, with the top sailors in the world, will vie for points that count towards the final competition for the 35th America’s Cup in 2017. Practice racing is on Friday, May 6, with point-scoring races on the weekend of May 7-8. In May/June 2017, the next America’s Cup will be raced in Bermuda. Elizabeth Canela, a senior project manager with Forest City Ratner Companies, and Ismene Speliotis, executive director of the Mutual Housing Association of NY, will present to Community Board 2 and guests on the open lottery for affordable apartments at 461 Dean Street. The presentation takes place at 6:00 pm, Wednesday, May 11, 2016; Ingersoll Community Center, 177 Myrtle Avenue at Prince Street, in Fort Greene. 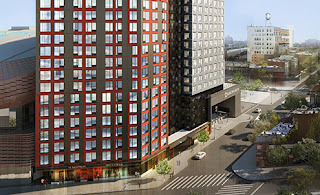 461 Dean is the first residential building to break ground at Pacific Park Brooklyn. The 346,000-square-foot, 32-story tower will be the world’s tallest modular building. 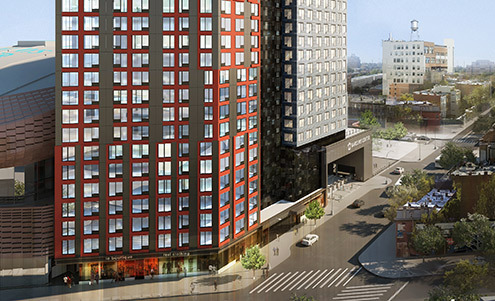 With 363 rental apartments, 50 percent of all units will be affordable to low- and middle-income households. 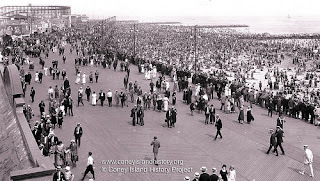 On May 4th, the City Council's Land Use Committee will be hearing testimony on Councilman Mark Treyger's resolution calling for Coney Island's Riegelmann Boardwalk to be designated an official scenic landmark. 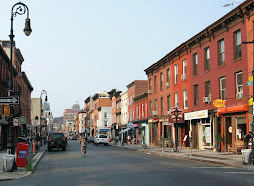 "The landmarking process in this city needs to be an equitable process, because the history and tradition of all of our city's neighborhoods must be preserved," says Councilman Treyger. "Too much has been lost already. The Boardwalk is a quintessential part of Southern Brooklyn's history, and I am encouraging all residents of Southern Brooklyn, as well as any New Yorker that remembers walking down the Boardwalk, feeling the cool ocean breeze embracing them, to join me on May 4th at City Hall. Let your voice be heard! Testify at this hearing and make sure the city administration and the Landmarks Preservation Commission know how much the Boardwalk means to you and to our city." 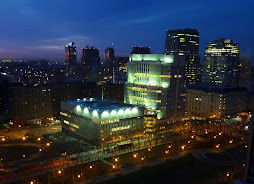 In February, Treyger introduced the resolution to the City Council where it received the support of all but one of the City's Council Members, as well as Public Advocate Letitia James. The resolution will be discussed at the Committee's May 4th 11:00 AM hearing in the Council Committee Room at City Hall. ONE°15 Brooklyn Marina has just opened at Brooklyn Bridge Park. It's the first new marina in the NYC area in years, and will provide docking for yachts as well as community boating programs and lessons. 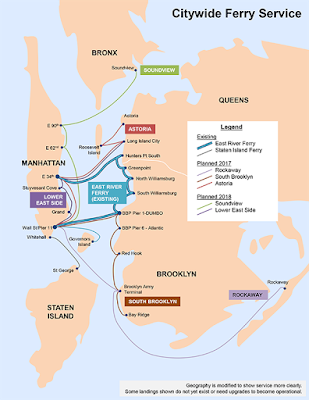 But some boaters are "up in arms" because a maritime company wants to install a barge mooring close by, putting a prime sailing area at risk, reports the Brooklyn Eagle. 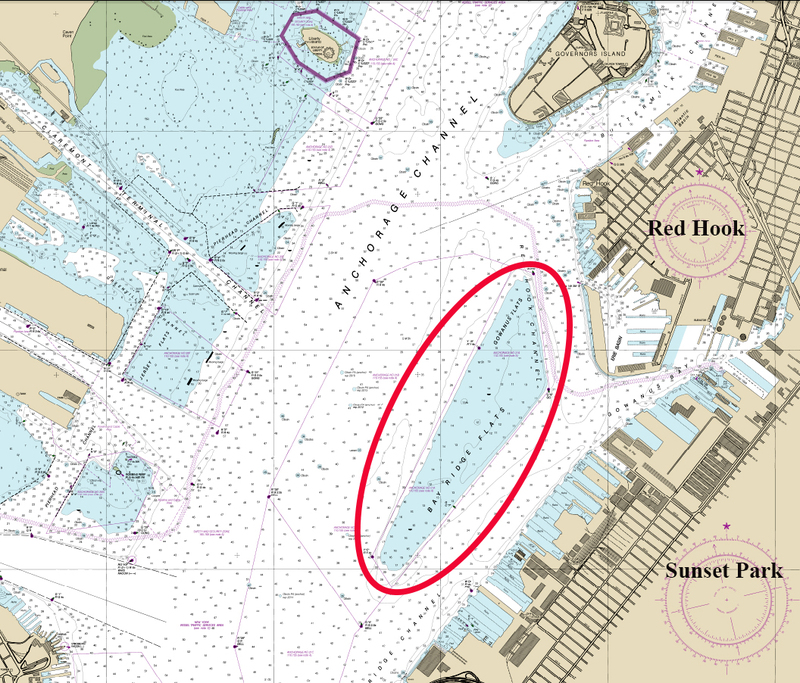 A moored barge would affect boaters’ ability to race in the harbor, a marina official said. More than 100 sailors from the ONE15 Marina already race weekly in the flats. A representative from the maritime company told the Eagle, however, that the mooring would be Just one of many. “I have no idea why they’re so upset," he said. See the Brooklyn Eagle for more. 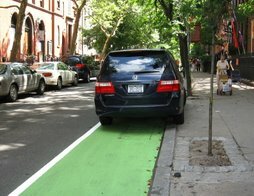 Brooklyn Public Library's "Bike the Branches 2016" takes place on Saturday, May 7. The fun day draws hundreds of riders. The library provides everything you need—including free bike rentals through Citi Bike, free family cycling lessons and free activities at every branch. Biking forecast: partly cloudy with a high near 70° ! To raise $$$ for the library, you donate $20 for adults and $10 for kids—with discounts for families and teams. Every dollar goes back to Brooklyn Public Library branches. The event features curated neighborhood tours—including a kid-friendly, Dora and Friends-themed ride around Prospect Park, in partnership with the Prospect Park Alliance. Prizes include entries into the 2017 TD Five Boro Bike Tour, Citi Bike Annual Passes or a Brompton folding bike. After the ride, there's a Bike the Branches Block Party on the plaza. Celebrate with live entertainment and post-ride refreshments from Smorgasburg and Sixpoint Brewery.